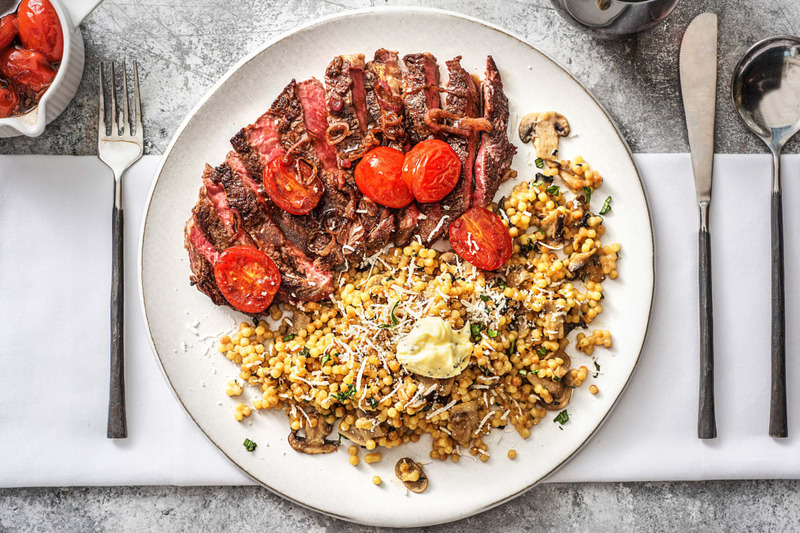 Treat yourself to a restaurant-style recipe that pulls out all the stops: not only does this dish feature a steakhouse-sized 20-ounce portion of rib-eye for two, it also goes full-on in the flavor department with luxuriant additions like a tomato balsamic pan sauce for the meat and truffle butter in the couscous. 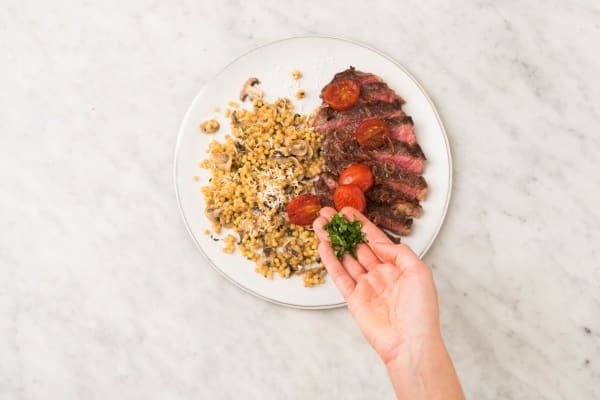 So break out the steak knives, the fancy plates, and a bottle of wine—making a special meal like this deserves a celebration. Wash and dry all produce. Mince or grate garlic. 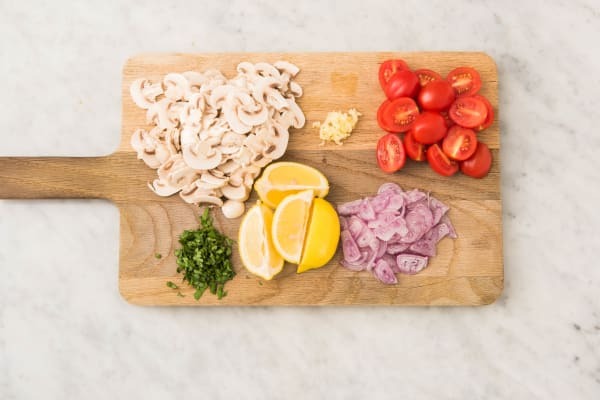 Trim, then thinly slice mushrooms. Halve tomatoes lengthwise. Pick basil leaves from stems; discard stems. Roughly chop leaves. Halve, peel, and thinly slice shallot. Cut lemon into quarters. Heat a drizzle of olive oil in a medium pot over medium-high heat. 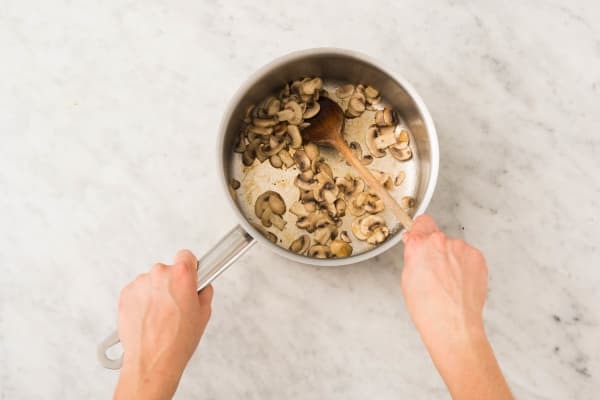 Add mushrooms; cook until they begin to brown, 5-6 minutes. Season with salt and pepper. Remove from pot and set aside. Heat a drizzle of olive oil in same pot over medium-high heat. Add garlic. Cook until fragrant, about 30 seconds. Add couscous to pot with garlic and stir to coat. Season with salt and pepper. Cook, stirring, until lightly toasted, 2-3 minutes. Pour in 1½ cups water. Bring to a boil, then lower heat and reduce to a simmer. Cook, uncovered, until al dente, 9-11 minutes. Once done, cover and set aside off heat. Meanwhile, heat a drizzle of vegetable oil in a large pan over medium-high heat. Pat steaks dry with a paper towel. Season all over with salt and pepper. Add to pan and cook to desired doneness, 4-6 minutes per side. Remove from pan and set aside to rest. (TIP: Keep steaks loosely covered with aluminum foil to keep warm.) Heat a drizzle of olive oil in same pan over medium-high heat. Add shallot and cook until soft, 1-2 minutes. 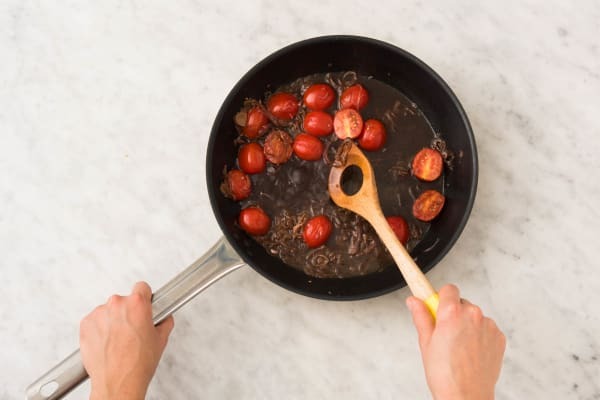 Add tomatoes to pan; cook until just softened, 1-2 minutes. Stir in vinegar and ½ tsp sugar; simmer until syrupy, about 1 minute. Stir in ¼ cup water and demi-glace. Simmer until just thickened, about 2 minutes. Remove pan from heat and stir in 1 TBSP plain butter. Season with salt and pepper. 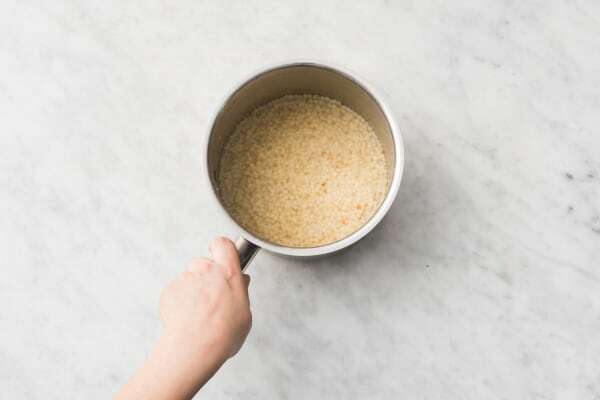 Fluff couscous with a fork, then stir in truffle butter (start with half and add more to taste) as well as mushrooms, a big squeeze of lemon, half the basil, half the Parmesan, and salt and pepper. Divide between plates and sprinkle with rest of Parmesan. 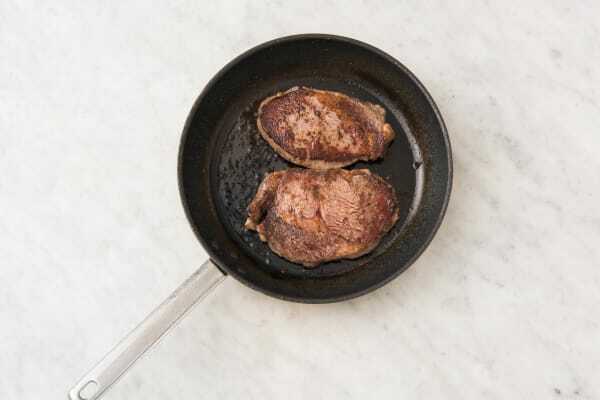 Add steaks to plates and spoon sauce over. Garnish with rest of basil. Serve with lemon on the side.